If you have a medical need — sudden flu symptoms, nagging back pain, an unexpected rash — who is your first point of contact? 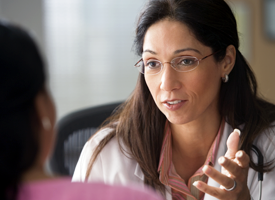 Find out why a family physician might be the right answer. If you have a medical need — sudden flu symptoms, nagging back pain, an unexpected rash — who is your first point of contact? A family physician can be the right answer for most healthcare situations. Medical emergencies are an exception. An emergency is a valid reason to visit the emergency room — but far too many Americans use the ER or urgent care as their primary source of care. It’s one reason among many we spend more as a country on healthcare than anyone else, yet still rank far from the top in health outcomes. Using more primary care physicians — including family doctors — can help. Here are just a few of the benefits for you and your family. I treat toddlers. I care for teens and people in their 20s. I treat middle-aged adults, retirees and people well into their 90s. I often see these same patients for years or even decades. That’s typical of family practitioners. Because family doctors treat a wide range of conditions, they can be your primary care physicians at any point in your life. When doctors treat you for years, they get to know your medical history inside and out. That helps them make accurate diagnoses, watch for red flags regarding medications and monitor changes in your health through the years. But the “family” in family doctor matters, too. Seeing multiple generations of a family can help a doctor record an accurate, in-depth family health history. For example, if I know you had cancer at a young age, and so did your mother, that’s a red flag. I will recommend genetic counseling and offer a screening plan not only for you but also for other family members at risk. Medical history is just part of the picture. Sometimes it helps to know what’s happening at home, too. When treating a child whose parent just lost a job, for instance, that information comes into play when assessing stress and anxiety. When doctors treat you for years, they get to know your medical history inside and out. Yes, family doctors do your yearly check-up. But they also can help you manage chronic conditions such as heart disease, diabetes and arthritis. They can treat acute situations such as sinus infections and injuries. They can help you throughout a pregnancy. They also can perform minor surgical procedures, such as freezing a wart or draining an abscess. These are but a few examples, and the list goes on. When you need to see a specialist for heart disease, cancer or any other serious concern, a family doctor can help find someone who fits your specific needs — and personality. Here’s an example: Say I have a patient who needs to see a cardiologist. I know from years of experience this patient prefers conservative treatments. That means I’ll search for a cardiologist who takes a conservative-first approach rather than someone known for aggressive treatment. There’s ample evidence — both here in America and abroad — that using more primary care saves money for a healthcare system. For example, according to an insurance study, a 23 percent increase in primary care spending in Rhode Island led to an 18 percent reduction in total healthcare spending. And data suggests that adding one primary care physician (such as a family doctor) for every 10,000 people can lower hospital admissions by 5.5 percent, emergency room visits by 11 percent and surgeries by 11 percent. Those numbers are even more impressive than cost savings. Family doctors can certainly save the country money, but more important, they can offer your family better health.